A Natural Approach Some of our beloved furry friends have skin allergies and sensitivities that can make it difficult to get clean and remain simultaneously happy. (Puppies & kittens often fall into this category.) 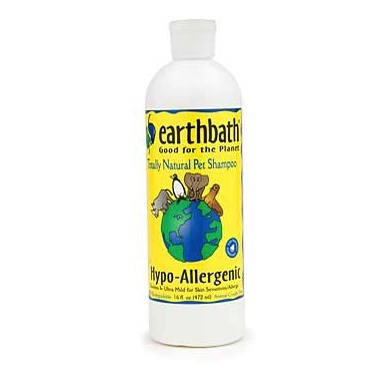 earthbath solved this dilemma by blending the finest natural ingredients into this mild, hypo-allergenic, tearless shampoo. It cleanses thoroughly and safely, and even the most sensitive skin will not be affected because we used only mild, safe, non-irritants. It will leave your pet's coat soft, plush, and smelling naturally fresh. Will not wash off topical flea applications. Safe for all animals over 6 weeks. Soap free. Ingredients: Purified water, extra-mild renewable coconut- based cleansers, aloe vera, xanthan gum, olive oil squalene (natural preservative). All ingredients are natural, 100% biodegradable, and gentle. This product contains no: parabens, phosphates, pthalates, DEA, synthetic dyes or perfumes. Any residue left behind is completely safe and will not harm your pet.